What is the best stain resistant sealer for my concrete driveway? If you have questions on any post, please feel free to comment. Alternatively, please Contact Us directly if you have a question on a different topic. We will respond as soon as possible. Thankyou. The surface finish of the concrete will determine the best sealer to use, from a safety point of view the sealed surface should not be slippery when wet. For smooth concrete finish use the penetrating Concrete Stain Repellent Sealer and for rough concrete finish use the Concrete Stain Repellent Surface Sealer. 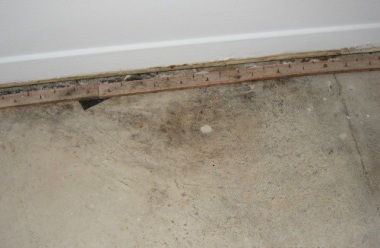 Moisture is penetrating the edge of the concrete slab and into the bottom of the wall resulting in damaged floor coverings and blistering paint on the wall. In this case it is necessary to inspect the outside area directly behind the highest visible damp point on the wall to determine the cause. Being a cavity wall the problem may be that on the other side there is a garden bed or that part of the wall is below ground, in this case the waterproofing has failed and needs to be re-instated. If there is no garden bed or that part of the wall is not below ground then it may be that the cavity is breached by mortar pieces and moisture from rain or sprinklers is being transferred from the outside leaf to the internal leaf of brickwork. If this is the case sealing the outside wall will solve your problem. This moisture problem is confined to the room in question and the removal of the mould is quite easy to do with household chemicals as a first step. Spray the area with a solution of 3 parts household bleach, one part water and a few drops of dishwashing detergent. 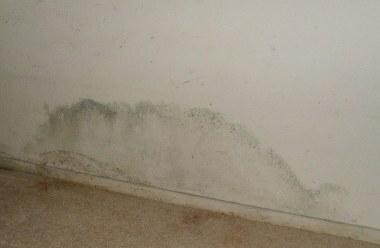 Continue to mist the area until all the mould disappears, rinse with clean water and dry the area. Mildew is mould in its early stages, mould grows on most surfaces that have moisture on it, a little warmth, infrequent lighting and where there is very little air circulation. 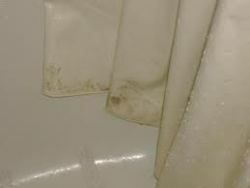 The average bathroom fits this description, you will find mould growing on the shower curtain, on the grout lines and even on the glazed tile surface. 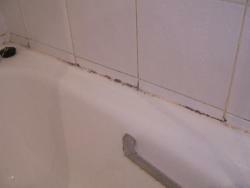 To prevent mould growing in this area simply leave the bathroom window open as wide as possible and leave the bathroom and shower screen doors open at all times. When using the shower/bath make sure the extraction fan is running and when finished showering/bathing wipe up excess moisture off floor and walls. In the case where you have a shower curtain make sure that it is in the closed position when not in use so that any moisture on it will run down or evaporate. Is the grout between your tiles quite soft? If you are looking for a product to seal it so that it does not wear away, our Grout Bond and Seal 4 product painted onto the grout lines will seal and harden the surface of the grout. 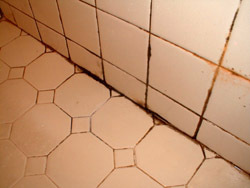 Work a small area at a time and be sure to remove any product from the surface of the tiles with a damp cloth before it sets. Normally the paving that is recommended for swimming pool areas are designed to be slip resistant and are of high quality. We recommend our Stain Resistant Paver Sealer and when ordering please specify whether you prefer a matt or light gloss finish. Please send us a photo of the paving to ensure that the sealer is suitable.